Well this week we were supposed to be at Pontins but we only lasted one night but thats a whole other story. So i thought I would show you the card I made recently. As you may have noticed, I like to use stars on the masculine cards but I also like to use butterflies on the feminine cards. I used the daisy Cuttlebug embossing folder on the card. 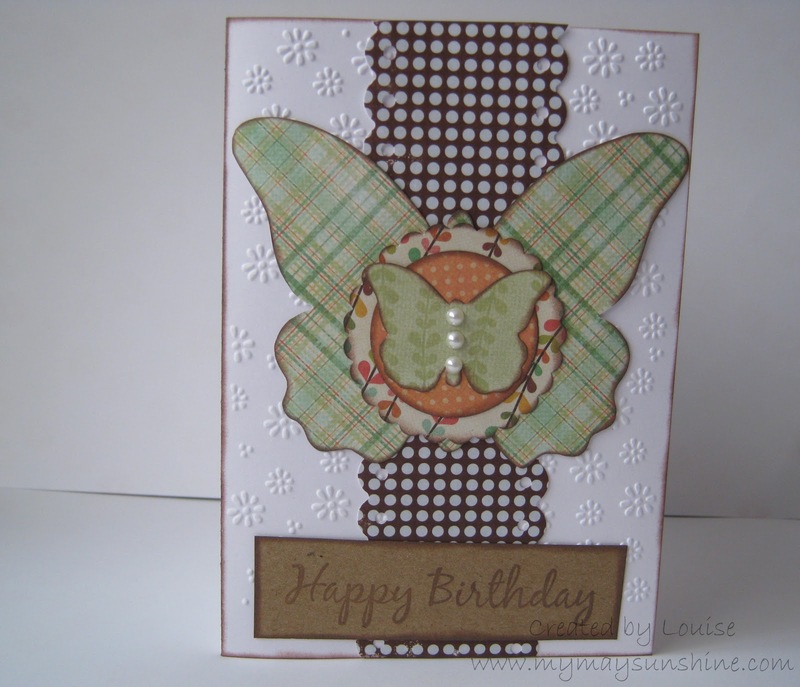 I like using the embossing folders on cards that are just plain background, it adds a bit of dimension to them. The paper is from My Minds Eye – Bloom and Grow and the brown dotted paper is from Making Memories – Just Chillin’ Boy ranges. The stamp is from Clare Curd at Papermania, I just inked the edge of most of the pieces and used the threading water punch on the brown dotted paper. So now I’m back at home instead of being on holiday, I might get some more crafting in.